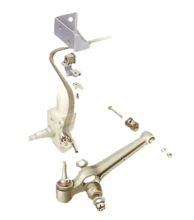 The unit-replacement strut has a detachable top section held by a clamp and two bolts. When the damper inside a MacPherson strut wears out, you can buy a replacement cartridge which — depending on type — may or may not include new parts for the strut itself. You will need a pair of coil-spring compressors. Hire them if necessary, do not use makeshift arrangements of clamps, wire or cord. They are unsafe. 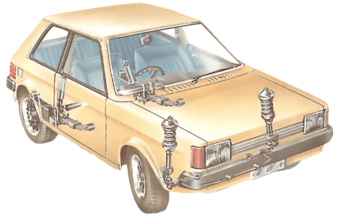 Loosen the wheel nuts and raise the car on axle stands under chassis or frame members. Remove the wheels, and open the bonnet or boot lid to gain access to the suspension from above and below. The standard MacPherson strut, which does not unbolt in the middle. It is attached by three bolts at the top and two at the bottom. Unscrew the three nuts above the mounting to release the top of the strut. Do not loosen the central nut between them, which would release the coil spring from the strut. Remove the two bolts underneath the track control arm, which fix the strut to the arm. 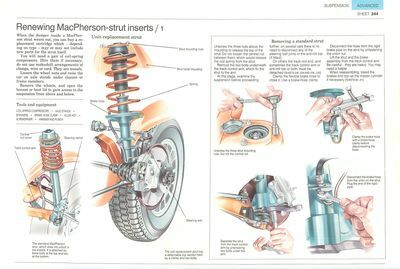 At this stage, examine the suspension before proceeding further: on several cars there is no need to disconnect any of the steering ball joints or the anti-roll bar (if fitted). 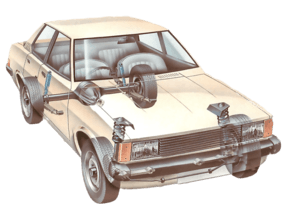 On others the track-rod end, and sometimes the track control arm or anti-roll bar or both, must be detached. Clamp the flexible brake hose to close it. Use a brake-hose clamp. Disconnect the hose from the rigid brake pipe on the strut by unfastening the union nut. Lift the strut and the brake assembly from the track control arm. Be careful - they are heavy. You may need a helper. When reassembling, bleed the brakes and top up the master cylinder if necessary. Unscrew the three strut mounting nuts, but not the central nut. Separate the strut from the track control arm by unscrewing two bolts under the arm. Disconnect the brake hose from the union on the strut. Plug the end of the rigid pipe. 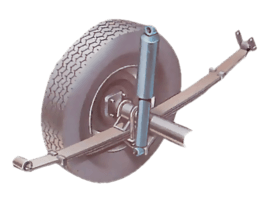 The unit-replacement strut can be split in two by removing two or three bolts. Unscrew the two nuts (on some cars three) above the top mounting turret to release the top of the strut. Do not unscrew the central nut between them, which would release the coil spring. The top part of the strut is fixed to the bottom part by bolts - there may be one, two or sometimes three. The lowest of the bolts separating the strut sections may be eccentric - refit in exactly the same position. With the bolts removed, free the top section of the strut. 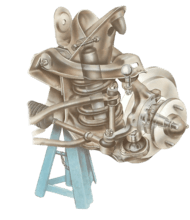 The lower, or lowest bolt may be eccentric, as a means of adjusting the camber. Mark its head so that you can refit it in exactly the same position. Remove the nuts and pull out the bolts to free the top half of the strut. Clamp the strut in a vice with the upper end highest. Compress the spring before removing the central nut. Clamp the strut in a vice with the upper end higher than the lower end to prevent the oil running out. 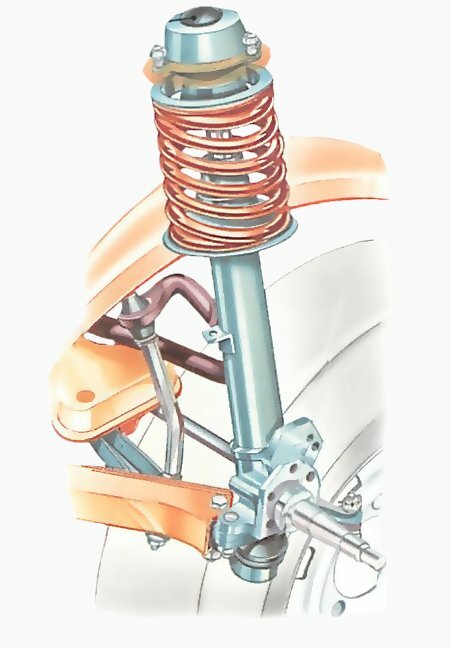 Fit a pair of spring compressors round at least four coils of the spring, and tighten evenly until the spring is well compressed and tension on the upper spring mount is released. On a unit-replacement strut, use an Allen key to release the top while holding the outer hexagon with a spanner. Then unscrew the central nut at the top of the damper; on a unit-replacement strut it must be unscrewed with an Allen key. Lift off the spring pan and its cap. Lift off the top spring pan and any spacers, and the upper bearing if applicable. Then lift off the compressed spring. Remove the spring complete with spring compressors. Keep the spring compressed ready for replacement. If there is a rubber gaiter round the damper, remove this too. Free the damper from the strut by unfastening the large gland nut between its two telescopic sections. If you do not have a spanner that fits the nut, put it in the vice and turn the strut. If the nut is rusty, penetrating oil will help to free it. Check the threads on the strut tube for damage, and clean them. You may now be able to remove the damper as a single, sealed unit. If so, clean the inside of the strut with petrol, let it dry and put in the new damper cartridge. Alternatively, you may have to dismantle the old damper to remove it, but it is not difficult to fit the replacement cartridge, because it is in one piece and includes a replacement piston arm. Remove the gland nut with a spanner, or clamp it in a vice and turn the strut. You may be able to pull the damper cartridge straight out of the strut - or it may need further dismantling. Read the instructions on the cartridge box. They may tell you to pour oil into the strut casing - usually 2fl. oz (50ml) of light engine oil or special damper oil - to cool the cartridge and prevent corrosion. Refit the gland nut. Fix it firmly by denting the outside of the casing in one spot with a hammer and punch. Refit the spring. Make sure it is set straight, then decompress it evenly. Fit the top spring platform, nut and packing pieces. Then tighten the centre nut fully. Refit the strut to the car. With a heavy standard-type strut you may find a jack helpful in raising the strut into its upper mounting.